I have a list in my head. 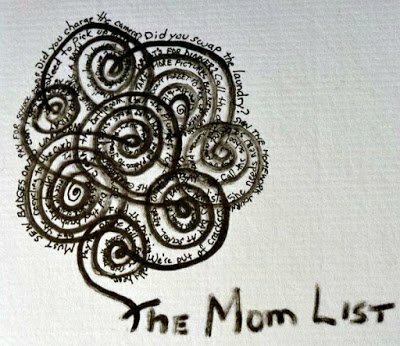 The mom list. It’s a constant recitation of all the things I should be doing, the things that need to get done. It never stops. It never shuts up. I can constantly hear it nagging me, “Did you swap the laundry? You need to pick up milk. We’re almost out of toilet paper. What can you put in the kids lunchboxes today? What are we having for dinner? Don’t forget to pay that bill. Did you charge the iPad? Is she eating enough vegetables? Don’t forget that doctor’s appointment on Friday. The garbage should go out today. Did you put salt on the porch yet? The kids need a bath. You should call your mother-in-law. You need to pack for Grace’s scouting trip. Did you swap the laundry?”, on constant repeat, but with approximately two million more items thrown in. Writing it down like that it sounds silly, trite. But it’s actually this loud echoing soundtrack that follows me around all day. And it overlaps with the other lists in my head, the blogger list, the me list. They are all constantly shouting at me, but the mom list seems to have the loudest voice, and it also stresses me out the most. Stuffed beavers visiting the house. Exciting for her, but just one more thing for me to worry about. Must make sure she does not lose the beavers. Or colour them with marker. Or take their non-removable hats off. Must help her write in the journal. Have to actually remember to write in the journal, and not send it back blank like I did last year when it was her big sister’s turn. Thinking of Scouts reminds me of badges. I’ve yet to sew any of the badges on to her vest. She’s been a Beaver since September. It’s January now, and there is a small pile of stupid badges waiting for me to sew them on. Same for her older sister who is in Cubs this year, bleeping piles of badges waiting to be sewn. Because I am a mom who works from home, the list in my head never stops. I am always aware that there is a household chore that I should be doing, or work on the blog that I could be doing. I don’t go home at the end of the day and put my feet up and relax. Home IS work. When I’m here and I’m almost always here, there is something practical I know I should be doing. I used to think I could check it all off. Get to the end of the list, and then have my well earned reward. But since becoming a mom I’ve learned the list Never Ends. It just chants at me, in ever loudening tones. Never stopping. Repeating. Grinding me down. Driving me crazy.There are never enough hours in the day. There is always something else I should be doing. I’ve taken a peek down that road, and that way my friends lies depression and burn out. Yes, I could talk about prioritizing, delegating, using time wisely and not frittering it away in moments here and there. And all of those are tools that should be used in conquering the unending list of Stuff That Must Be Done. But the truth is, sometimes you just need to turn it off and tune it out. You need to hit pause on the mom list, and just focus on you. I’ve been doing a few things to silence the unending mom list soundtrack in my head. I’ve been taking a walk, by myself, after I drop the kids off at the bus in the morning. It’s a weather permitting sort of thing that I started back in September when my youngest joined her sister in the land of full-time schooling. As I walk I find the list playing itself through my head in quieter, slower loops. I remember things I’ve forgotten. I have light bulb moments, where new things pop into my head. I’ve been writing it all down. On paper. If I write it in my To Do list book I can stop playing it through my head on loop and repeat. “Did you do this yet? Don’t forget?” Shh… I wrote it down. Shh… I’ll get to it. I’ve set aside one night a week to work on my blog. One night a week where getting dinner ready and getting the kids into bed is my husband’s responsibility, instead of mine. On night when I can forget about the household chores and all the crap on the Mom List and just focus on writing for a few solid hours in a row. I’ve been watching more Netflix. Yeah that sounds like a weird one to list as a positive, right? But I’ve been trying to make the time each night to head downstairs and collapse on the couch and watch something with my husband for an hour or two before heading off to bed. I’ve never been able to simply sit and watch TV (well, not without falling asleep sitting up, and I snore). Years ago I used to sit and work on cross stitch patterns whenever I watched TV. Lately TV time is when I do boring backend type blogging stuff, like promote my giveaways on link-ups, or make sure I’m following back all the non-spammy folks who followed me this week on Instagram (or it’s when I sew those damn Scouts badges onto my kids vest). I feel like I’m accomplishing something, while simultaneously binge watching Buffy. It’s oddly satiating, and I’m too busy multi-tasking between whatever I’m working on, and following along with the plot on whatever show we’re watching, to hear any silly sound track in my head. What about you folks? How do you carve out me time? Please tell me I’m not the only one with an overactive brain that chants on repeat. What do you do to silence the mom list? I loved the picture – What the inside of my head looks like. I remember what it's like, there were always a million things to do and I always had a to do list that seemed to get longer and not shorter. With 7 kids the washing was never ever finished but since it was always there that didn't go on the list. I also had a vegetable garden so I had to squeeze time in for that too. Now that I'm retired I often wonder how on earth I found the time to do it all. I certainly couldn't do it now. My brain is on overload! I work out of the home so all those chores have to be completed between when we get home at 6 and when we leave again at 8am – in between figure skating, gymnastics, girl guides – the forms and amount of clutter that's accumulated with no time to sort and purge! How do you fit it all in? If you find the answer please please please tell me!! !